This modern dwelling is north facing is on two levels with all the bedrooms upstairs. The main bedroom has a large deck overlooking the water and the main living area downstairs also opens out through large glass sliding doors onto an inviting alfresco area overlooking the water. With our own private pontoon, it is possible to moor private watercraft for the duration of your stay. There are three separate courtyards, so you can take your pick as to where you would like to have your afternoon tea. The gardens are maintenance free and require no special treatment at all. The lawns are taken care of by a professional groundsman. There is a lovely walking path right in front of our home which meanders to the main town centre and beyond. Paths, boardwalks and lookouts take in some of Australia's most spectacular beaches and scenic coastline. Port Macquarie is famous for its beachside extensive walkways. Port Macquarie has an abundance of trendy cafe's to choose from and dining out is an absolute delight. The temperate climate is second to none, which makes outdoor activities and alfresco dining a must. Our home has a wonderful resort feel as you enter the front door and continues to draw you in to its clean bright atmosphere. All the hallways and stairwell are built with generous proportions, as are the bedrooms. This is a home that is very easy to live in. It is comfortable and relaxed. We have thoroughly enjoyed every minute of our time in this lovely home. We have really enjoyed living here because we like to go for an early morning walk along the river. The area is very popular for walking, running and cycling as it is generally flat where we live. On the weekends we will often stroll into the main town centre for breakfast and then stroll home again, which takes about 15 minutes each way. It is not unusual for us to see dolphins frolicking right in front of our lounge room and we never take them for granted. They are such beautiful creatures and our river has an abundant supply of them to observe, especially from the magnificent foreshore which runs along the river adjacent to the main CBD. Just 4 minutes walk to a reasonable and functional shopping centre which supplies all our daily needs. This includes a large Woolworths. Panthers club is also only a few minutes walk away, where you can eat, drink or watch many and varied shows. Public transport is available just at the end of our street. It is very quiet where we live, with mostly middle aged retired couples. Even though it is very quiet living, it is very close to the action if that is what you prefer. We love the solitude here and the easy access to everything else. 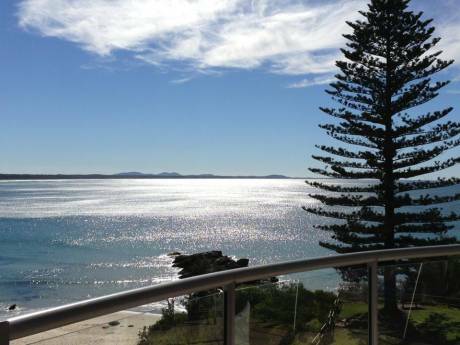 It is only 5 minutes by road to the pristine beaches of Port Macquarie. 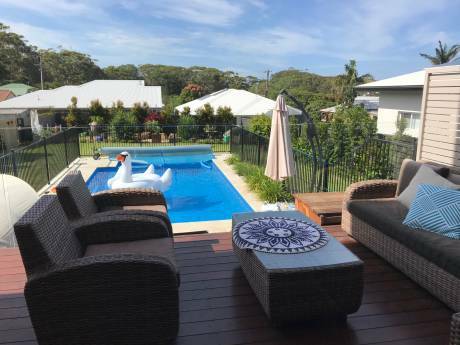 And just a 25 minutes drive to the beautiful township and waterways of Laurieton, North Haven and Dunbogan. And if you would prefer the mountains, it is just 45 minutes drive to the beautiful village of Comboyne. It is a little taste of England. Young at heart and enquiring of spirit, we are both creative professionals (55 and 62) with keen perception and generous natures. We are exceptionally careful in our appreciation and handling of both natural and man-crafted works of value. We find pleasure in leaving a place even better than we find it. We resonate to good taste, originality and thoughtfulness. You will find hints of who we are in our home though, like a good book, most of us is not so easily discovered. We speak English with our mouths but transcend all barriers with our hearts. Music, art, literature, philosophy, history, theology, science and much more are portals to worlds beyond the superficial. We find enormous joy in our children and our three small grandchildren — who live close by. The contrast between the innocent (almost naiive) country town of Port Macquarie and the boisterous insanity of big cities like Sydney is one good reason we choose to live here. www.carlneedham.com will give you a small peak . . .